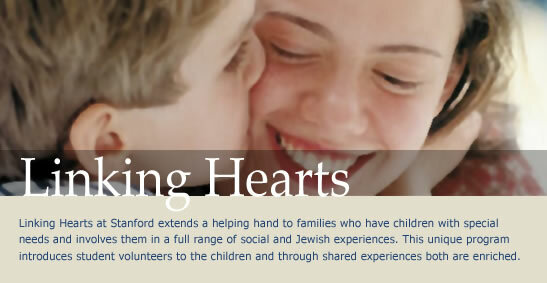 Linking Hearts at Stanford extends a helping hand to families who have children with special needs and involves them in a full range of social and Jewish experiences. This unique program introduces student volunteers to the children and through shared experiences both are enriched. The program includes: weekly visitations by the students to the homes of their Special Friends, field trips and holiday programs. In addition, on designated Sundays, volunteers and their Special Friends spend two wonderful hours together at the Chabad House at Stanford, as professionals in the areas of music, drama, art, and Jewish Heritage Studies work with everyone in a very warm and loving environment. Linking Hearts at Stanford is made up of five components: Student volunteers, children, parents, staff and supporters. The true beauty of this endeavor is our heart to heart connection to form loving friendships. Together, we can perform miracles.